Ce document au format PDF 1.4 a été généré par Arbortext Advanced Print Publisher 9.1.510/W Unicode / Acrobat Distiller 10.0.0 (Windows), et a été envoyé sur fichier-pdf.fr le 03/08/2015 à 17:42, depuis l'adresse IP 89.225.x.x. La présente page de téléchargement du fichier a été vue 805 fois. Taille du document: 1.3 Mo (11 pages). information among widespread, specialized subdomains (3). mind can manipulate these representations remains unknown. 100 abstract parts that could be combined into 2 × 2 ﬁgures (Fig. (chance would be 1 out of 4 correct; Fig. 1E). differences in activity between the two manipulation conditions. brain that supports the manipulation of visual imagery. and D.K. analyzed data; and A.S., P.J.K., S.V.F., and P.U.T. wrote the paper. To whom correspondence should be addressed. E-mail: schlegel@gmail.com. content relevant to the mental operations. a multivariate pattern-classiﬁcation analysis (5) within each ROI. time course of correlations with each model in occipital cortex. 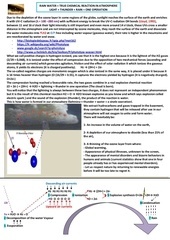 stimuli to the output correlation time course. manipulation and maintenance conditions in the correlation (within the green squares in B). Table S3 shows full statistical results. visual imagery represented at least partially in the occipital cortex. by analyzing patterns of functional connectivity between the ROIs. determine which connections were most informative (Fig. 5A). 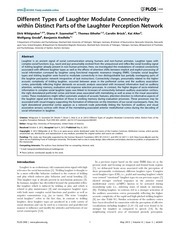 two connectivity proﬁles depending on whether mental representations are maintained or manipulated. sequence from input mental representation, through operation, to output representation (asterisks indicate signiﬁcant ROIs). Table S4 shows full statistical results. both internally and perceptually generated visual experience. corresponding mental representations in the same regions. and suggest that it acts as a hub in the mental workspace network. connectivity in the manipulation and maintenance conditions. Red sensitivities are positive, driving the classiﬁer toward choosing “manipulate.” Blue sensitivities are negative, driving it toward “maintain.” Only signiﬁcant nonzero sensitivities are shown [P ≤ 0.05, corrected for similarity between folds (36)]. connectivity are shown (P ≤ 0.05), and differences surviving FDR correction are shown in saturated colors. during which participants practiced the tasks and an fMRI session. instructed to indicate the target within 4 s of the test screen’s appearance. achieved an accuracy of two out of three correct responses in each trial type. See SI Materials and Methods for an extended description of the task. acquisition parameters and preprocessing steps. occipital gyrus; cuneus; occipital pole; superior occipital and transverse occipital sulci; and anterior occipital sulcus. comparisons (one for each ROI). a confusion matrix for each time point and ROI, and these confusion matrices were correlated with each of the model similarity structures in Fig. 4A. N grand means of the data are calculated, each with one subject left out. likely involved in the mental operations performed by participants. suggests that these hubs serve distinct functions across the tasks. within a sparse core of this network that itself supports manipulation of representations. over time in accordance with the manipulations performed. components that directly mediate mental operations. ﬂexible cognitive abilities that characterize our species. the expected progression if and only if both of these contrasts were signiﬁcant at P ≤ 0.05 uncorrected. sensitivities shown in Fig. 5A are signiﬁcantly different from zero in a onesample t test, corrected for the low variance because of the similarity between folds (36), and thresholded at P ≤ 0.05. Publications, Inc., New York), p 142. Basic evidence and a workspace framework. Cognition 79(1-2):1–37. 3. Baars BJ, Franklin S (2003) How conscious experience and working memory interact. objects in ventral temporal cortex. Science 293(5539):2425–2430. in early visual areas. Nature 458(7238):632–635. imagery during sleep. Science 340(6132):639–642. 9. 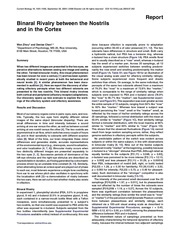 O’Reilly RC (2006) Biologically based computational models of high-level cognition. 10. 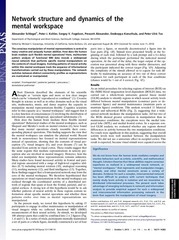 Zacks JM (2008) Neuroimaging studies of mental rotation: A meta-analysis and review. J Cogn Neurosci 20(1):1–19. of creativity in analogical reasoning. J Exp Psychol Learn Mem Cogn 38(2):264–272. synchronization during visual working memory. Science 338(6110):1097–1100. 14. Fox MD, et al. (2005) The human brain is intrinsically organized into dynamic, anticorrelated functional networks. Proc Natl Acad Sci USA 102(27):9673–9678. memory in prefrontal cortex of the macaque. J Neurosci 16(16):5154–5167. 16. Todd JJ, Marois R (2004) Capacity limit of visual short-term memory in human posterior parietal cortex. Nature 428(6984):751–754. memory for objects. Nature 440(7080):91–95. fusiform face area to face working memory. 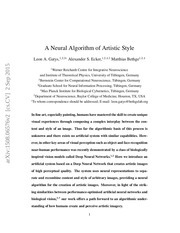 J Cogn Neurosci 15(6):771–784. 19. Baddeley AD (1986) Working Memory (Oxford Univ Press, New York). 20. Margulies DS, et al. (2009) Precuneus shares intrinsic functional architecture in humans and monkeys. Proc Natl Acad Sci USA 106(47):20069–20074. and behavioural correlates. Brain 129(Pt 3):564–583. basal ganglia. Trends Cogn Sci 17(5):241–254. 25. Tononi G (2008) Consciousness as integrated information: A provisional manifesto. 26. Ryan L, Lin C-Y, Ketcham K, Nadel L (2010) The role of medial temporal lobe in retrieving spatial and nonspatial relations from episodic and semantic memory. Hippocampus 20(1):11–18. 27. Schall JD (2004) On the role of frontal eye ﬁeld in guiding attention and saccades. Anatomy, function, and relevance to disease. Ann N Y Acad Sci 1124:1–38. and hippocampal contributions to visual working memory maintenance and associative memory retrieval. J Neurosci 24(16):3917–3925. mental rotation network revealed by pattern recognition analysis of fMRI data. during visuospatial mental imagery. Neuron 35(1):185–194. implementation as FSL. Neuroimage 23(Suppl 1):S208–S219. and surface reconstruction. Neuroimage 9(2):179–194. Board guidelines of Dartmouth College before participating. scaled with the number of control points used to generate them. Any four parts could be assembled into a 2 × 2 ﬁgure (Fig. 1A). task independently for each participant. smoothed with a 6-mm FWHM Gaussian kernel. Structural images were processed using the FreeSurfer image analysis suite (2). transverse occipital sulci; and anterior occipital sulcus. chose the correct target in two out of three trials. of each trial (the period during which the operation was performed, after shifting by a 4-s estimate of the HRF delay). across the 12 comparisons (one for each ROI). only if both of these contrasts were signiﬁcant at P ≤ 0.05 uncorrected. folds (4) and thresholded at P ≤ 0.05.
anticorrelated functional networks. Proc Natl Acad Sci USA 102(27):9673–9678. new ROIs by eroding each original ROI until it consisted of the same number of voxels as the smallest of the eight ROIs (127 voxels on average across subjects). Confusion matrices and results of correlation analysis as in Fig. 3C but using the ROIs described above. for each ROI between classiﬁcation accuracy and RT difference as in ref. 1.
supplementary eye ﬁeld; THA, thalamus. 1. Maus GW, Fischer J, Whitney D (2013) Motion-dependent representation of space in area MT+. Neuron 78(3):554–562. deconstruct ﬁgure; MP. maintain parts; MF, maintain ﬁgure. Abbreviations for ROIs are as in Table S1. Abbreviations for ROIs are as in Table S1. operation: 1; output: 0); LC, linear contrast result. P values for negative contrast results are not shown. Ce fichier a été mis en ligne par un utilisateur du site. Identifiant unique du document: 00344490.